If you’re searching for “Commercial Signs“, “Sign Company Near Me“, “Commercial Building Signs” or “Sign Company Phoenix“, Western Signs & Lighting can help! Receive a free commercial sign estimate anywhere in the Phoenix Valley by giving us a call today at (480) 831-8600. Western Signs and Lighting is the premier Sign Company serving Phoenix & Mesa, Arizona, offering commercial business signs (Interior & Exterior), vehicle wraps and more! We are a fully bonded, licensed and insured sign manufacturer serving the State of Arizona, serving Mesa and all of the greater Phoenix Metropolitan area. We provide custom-designed commercial building signs, indoor office signs, monument, neon signs and metal signs for retail & commercial use. Building Signs | Freestanding Signs | Monument Signs | Shopping Centers | Sign Faces | Flag Pole Signs | Changeable Copy Boards | Store Font Signs | Interior Signs | Office Signs | Lobby Signs | Cabinet Signs | Digital Displays | LED Signs | Neon Signs | & Much, Much More! What Type of Commercial Sign do You Want or Need? Our motto is “Your Image, Your Way,” and we mean it! From start to finish, we can take you through the process of commercial sign design, sign permits, landlord approval, fabrication, installation and ongoing maintenance. When completed, you will have a high quality sign that will enhance the exterior image of your building or interior of your office. View our commercial sign gallery. If your building sign or security lighting is in need of service, maintenance, or repair, we can also provide experienced, competitively priced technical sign services and quality parts to bring back the lights. We offer the full range of exterior signage for your commercial building and indoor signage options for your office as well! Our years of experience in the Phoenix Valley has given us a unique expertise in sign installation that matches traditional desert motiffs and climates. This helps us understand which signs will get the attention of potential customers and have the right visual impact. We can design, fabricate, and install ANY TYPE OF COMMERCIAL SIGN!!! Whatever your commercial signage needs we encourage you to navigate through our website, view some of our completed lighted and outdoor sign projects and read what our clients have to say about our work. If you’ve got questions one of our design specialists will be happy to help you. 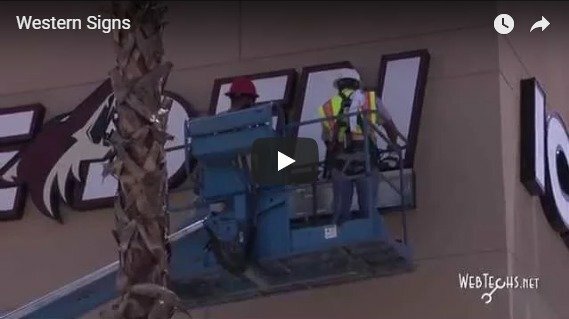 As Phoenix’s #1 full-service sign company, Western Signs & Lighting, LLC offers a complete lighting maintenance program, for property management, to ensure your parking lot or building security lighting remains at peak operating efficiency. We are proud to help you set up or maintain aesthetically pleasing and safe lighting conditions in any area, all with competitive pricing plans to select from. From start to finish, concept to completion, we will take your sign design idea through the approval and permit process, into fabrication, and from there, the installation and completion of your new custom sign. Our custom commercial signs have been created for customers all over the State of Arizona Including Phoenix, Mesa, Chandler, Scottsdale, Gilbert, Tempe & Glendale. Receive a free commercial signage quote anywhere in the Phoenix Valley by giving us a call today at (480) 831-8600.